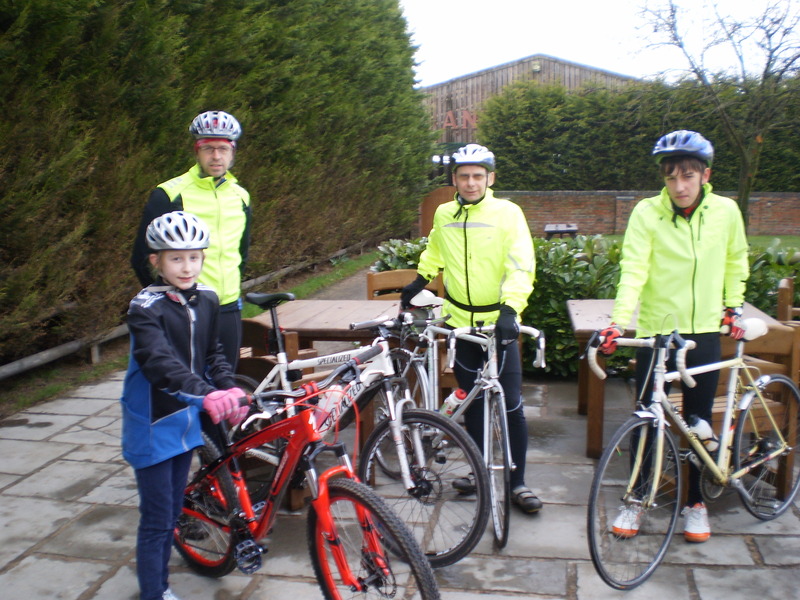 Ten riders rode to Beeston Lock Cafe, including teenagers Sam French and Mark Allen and new member Steve Kirkham. The others were Georgina Norton, Sue Blake, David Hurst, Peter Nelson, Ed Wright, David McVitie and Jim Cook. The River Weaver is a barrier to the west in Cheshire, with not too many crossing points. On this day the group crossed at Davenham on the way out to go through Whitegate and Little Budworth and returned via Bunbury and Wettenhall to cross back over the Weaver at Church Minshull. The return trip was delayed by a puncture on Sams bike which was soon fixed by Jim Cook, who fitted a new inner tube in no time. The group arrived back in Congleton to complete a ride of about 60 miles. 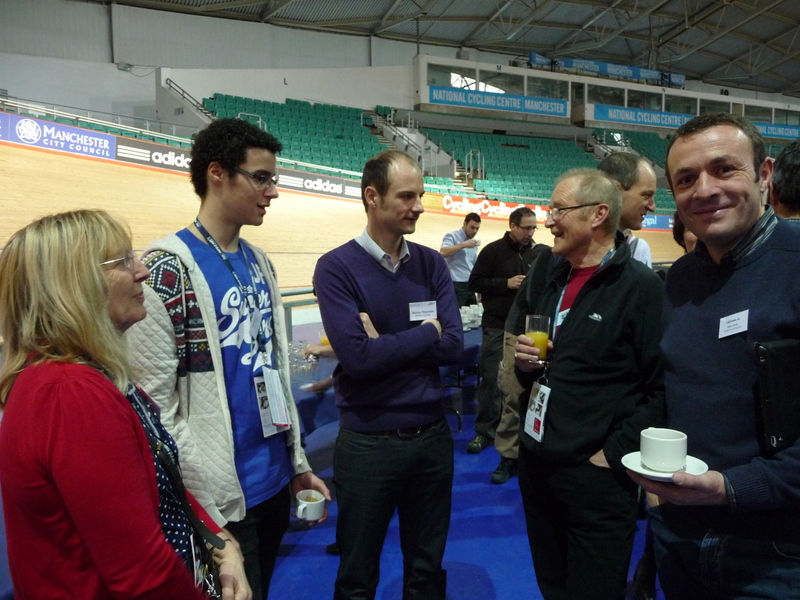 Our Club made further significant progress to achieving British Cycling’s go-ride accreditation as five Members participated in various workshops, throughout the day: Pete Smith did a further Coaches Training, Georgina Norton did her “Further Safeguarding” as part of the Welfare Officer Training, Tristan Roberts did his New Young Volunteer Training and Bob Norton and Peter Hayhurst did their Go-Ride Volunteer Training. These were in-depth sessions conducted by professionals who not only gave excellent presentations but included plenty of discussion time, including inter-action with other participants and quizzes at various stages and then were sent home with much reference material on a USB Memory. Four Members rode this event, their first of the new season. Pete Tatton, 25:36; Mike Jones, 27:46; Angelo DiAngelis, 33:03 and David Hurst, 39:07 did not enjoy the cool, damp conditions. The winner of the Open Event was Tony Greenhalgh of Team Wheelbase, with 22:25. 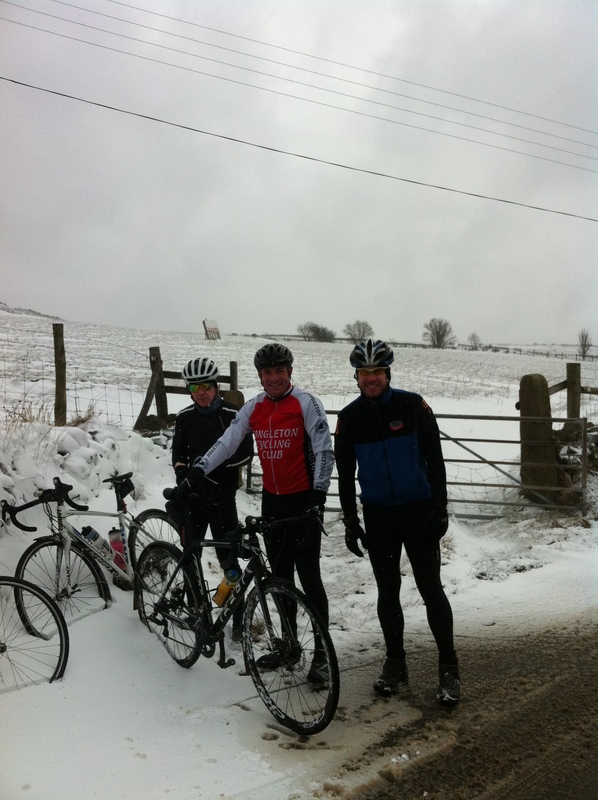 Our Hilly Reliability trial was postponed until March 24th, due to freezing conditions and snow. Even so a few hard nuts tried it. Pete Smith, Mike Jones, Stephen Jackson, Andy Malbon and Chris Dale, made it as far as the Hanging Gate, where they turned back after encountering several inches of snow. Wayne Powell and Bob Norton did the short route over to Rushton Spencer and back through Bosley Wood Treatment. Phil Gayes and Rich Coghill of the Leek C.C. made it round. They are hard in Leek! This, being the third weekend of the month saw two club runs. On Saturday there was the monthly social ride, which this month went to Wheelock Farm via Rode Heath, Alsager, Barthomley and Haslington. Only three riders set off on what promised to be a showery day but was in fact dry. They were Georgina Norton, Bob Banner and Mark Allen. They were met before the cafe stop by 10 year old Hollie Mulroy with her dad Dave. This was Hollies first meeting with a club run. She had recently completed her Bikeability training, which gave her the competence to ride on the road. Hollie also rode the first few miles of the return journey with the group and did very well. The return to Congleton was completed passing Sandbach Flashes to Cledford and then through Brereton Heath for a round trip of 27 miles. Sunday dawned with yet another dusting of snow. Five members were undaunted. Stephen Kane made a welcome return after his bad accident in December, and rode part way with Rob Waghorn, Jim Cook, Sam French and Bob Norton. The group, riding briskly to combat the early cold, worked their way through to Chelford in the lanes past Newsbank and Lower Withington. There were then some hills to help keep warm, starting with the climb up Artist’s Lane to the Wizard at Alderley Edge, before descending to Prestbury. Another loop, took the riders to Adlington and then more narrow lanes skirting Poynton and Higher Poynton, brought them to a well-earned refreshment stop in the Coffee Tavern at Pott Shrigley. After lunch, there was a bit more climbing, and then a long down hill into Bollington rested the legs, ready for more uphill between Prestbury and Broken Cross, from where the route back went through Gawsworth and North Rode. The ride distance was 47 miles. This contained about 2300 feet of ascent. It’s a sobering thought that the clubs hilly reliability trial scheduled for next Sunday does about twice this figure in only 33 miles! Georgina Norton was our sole supporter, having continued after the Social ride. In good conditions, four Members rode this event, the first of the new season for two Members. Pete Tatton, improved to 25:19; Jamie Willetts, 25:48, David Hurst improved to 35:55 and Peter Nelson posted 39:17. The winner of the Open Event was Mark Turnbull, Leigh Premier, with 21:49. The event was run on an emergency course (actually the Cranage / Toft circuit) because of road works near Jodrell Bank. Two Members, Kelvin Milward and Duncan Poole completed the Leek Hilly Reliability. Not that newsworthy except that the furthest they have ridden for a while is about 30 miles not the 52, very hilly miles and in very low temperatures as well! From Leek, the route climbed over to Onecote, then Grindon and Alstonefield, Alsop, Longridge, Grangemill, Youlgreave, Monyash, Hartington, Crowdecote, Longnor, up to Morridge (Mermaid) and down to Leek. Very scenic but very tough – especially at this time of year! View our “refreshed” website: www.congletoncyclingclub.org.uk.